City of New York, 03.07.1869, 50 Shares á US-$ 100, #5232, 24,3 x 30,7 cm, schwarz, beige, Capital Stock 180.000 Shares, stempelentwertet, lochentwertet, Vignette mit Pferdegespann und Schiff im Hintergrund, Hundekopfvignette links, Original-Signaturen von Fargo, Ross und Knapp. City of New York, 3 July 1869, 50 Shares á US-$ 100, #5232, 24.3 x 30.7 cm, black, beige, Capital Stock 180.000 Shares, stamps, cancellation holes, vignette with horse carriage and ship, original signatures of Fargo, Ross and Knapp. In 1841, Henry Wells undertook his first „express“ trip by rail and stagecoach from Albany (New York) to Buffalo. In his luggage he included gold, silver, paper money, and stocks and bonds for merchants in Buffalo. 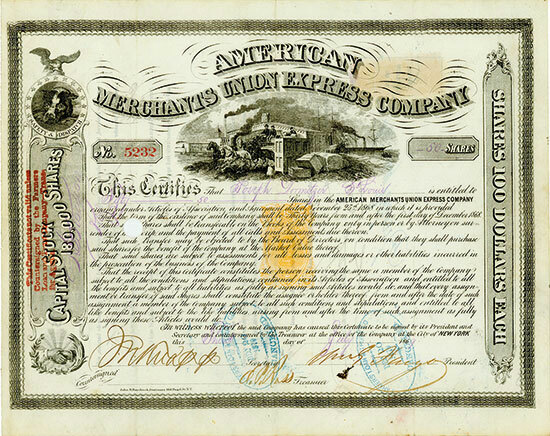 Nine years later, on March 18, 1850, the American Express Company was founded. Henry Wells, William G. Fargo, and others merged their stagecoach businesses into it. To be sure, the company was limited to a period of ten years so that on New Year’s Day 1859 it was totally auctioned off. The purchaser was a new Amexco, whose owners were identical with those of the old company. Thus the certificates distributed starting January 1860 were given a new layout. While the first documents had an image of a train, on the newer documents a dog’s head was sketched. In 1868 the company merged with the Merchant’s Union Express to form the American Merchant’s Union Express. In 1873 the firm was renamed the American Express Company. In its beginning years, American Express offered no financial services, but the company had many large banks and brokers as their customers. American Express realized that transporting share certificates, currencies and other bank products is much more profitable than transporting heavy freight. In 1882, money orders got part of the services American Express offered. This was the first step in the finance business. The first traveller cheques were offered in 1891. American Express entered the card business not before 1958. The first cards were made of paper. In 1959 the first plastic card was introduced. The first Credit Card, called Optima Card, was offered by the American Express Company in 1987. Round about one fourth of all Credit Card transactions in the United States are done with an Amex-Card nowadays.